Download a FREE Copy of Brendan Casey's special report: "Six Costly Mistakes Most Hydraulics Users Make... And How YOU Can Avoid them!" Not only that, you won't find this information in the machine manual and it's not taught in everyday, 'how-it-works' hydraulics classes. But all you need do to get it NOW is enter your email address in the box below and click on the "Free Instant Access" button. 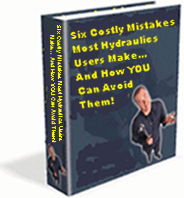 You'll then be sent an email with a link to download your FREE copy of "Six Costly Mistakes Most Hydraulics Users Make... And How YOU Can Avoid them!" YES, add me to Brendan Casey's email list and send me my free report. **Please double check your email is correct or you won't be able to get this FREE report. I take your privacy seriously; your information will NEVER be shared.